This title will be released on June 4, 2019. Sensitive Claire Connolly must journey to another world in the electrifying fourth installment of Chloe Neill's post-apocalyptic urban fantasy series. It's been a year since the Veil between the human world and the world Beyond was torn apart, and war began again. Sensitive Claire Connolly and bounty hunter Liam Quinn have been helping their human and paranormal allies fight back against the ravaging invaders and save what's left of New Orleans. But a new enemy has arisen, more powerful than any they've seen before, and even Devil's Isle cannot hold her. . . This title will be released on December 3, 2019. This title will be released on October 29, 2019. 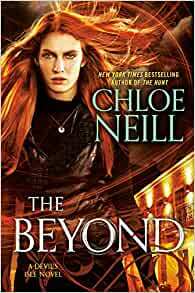 Chloe Neill is the New York Times bestselling author of the Chicagoland Vampires Novels (Blade Bound, Midnight Marked, House Rules), the Dark Elite novels (Charmfall, Hexbound, Firespell), and the Devil's Isle Novels (The Hunt, The Sight, The Veil). Pre-order The Beyond (A Devil's Isle Novel Book 4) for your Kindle today.